Modifications: Added 2 chopped celery stalks, and used a full onion (Does anyone actually use half an onion??) I didn’t have pre-cooked chicken, so after sautéing the vegetables, I added 2 chicken breasts, sautéed for a bit after seasoning them and then added the broth. After it started boiling, I turned the heat down to low-medium and kept simmering for about 15-20 minutes, until the chicken was cooked through. Took them out, chopped up, returned to the pot and proceeded with the recipe as written. Kids: Dislike! LEMON! DIFFERENT FLAVORS ARE SCARY!! Major eye roll emoji to them. Notes: I was very nervous about adding the eggs, but followed some of the instructions in the comments to temper the egg before adding back to the soup. SLOWLY added some of the broth mixture to the egg while stirring constantly, and then I actually added a cup of cold water back to the soup to cool it down, and then added the egg mixture in, slowly, while stirring. 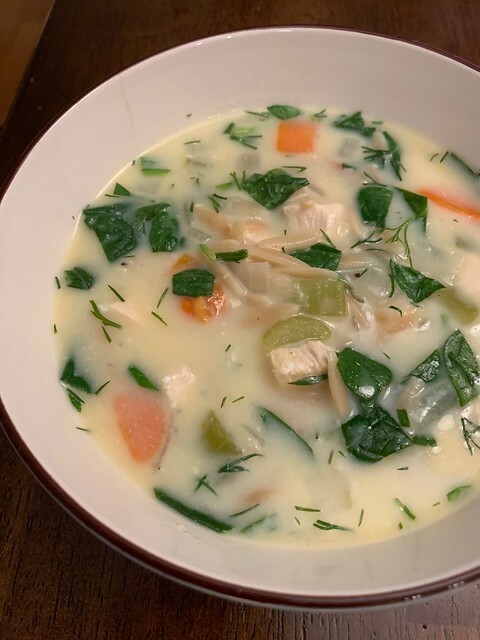 I really loved the lemon and dill flavors in this soup, a much more interesting version of chicken noodle. My children obviously did not agree, but the adults enjoyed (as usual). This entry was posted in carrot, celery, chicken, eggs, lemon, onion, pasta, spinach. Bookmark the permalink.